The opportunity to review this bag came at just the right time. After many attempts at finding a suitable lunch bag for my boys, I was determined to find one that would stand up to the general beatings and constant usage that previous lunch bags had dismally failed at. I was given a choice of bags and my son chose the Blue Star. He loved the funky stars and the bright colours, and I must admit so did I. Boys themed items can be a bit hit and miss and not always age appropriate, but the design looked really simple and classic and we were both happy with his choice. When the bag arrived it was beautifully packaged and presented in a lightweight drawstring bag with the Apple and Mint logo on the front. Inside was the lunch bag, and another small grey bag which contained a plastic bag of water which looked like a melted ice pack. The instructions that came with the package informed me this was the 8 hour cooling panel and I needed to put it in the freezer to freeze for a minimum of five hours to use with the lunch bag when the time came. The lunch bag itself was lovely. It had a rustic look, and I was happy to see that my initial skepticism of it being a pale colour was wiped out when I realised that the exterior was actually made from an easy to clean and water resistant coated linen. The brightness of the stars didn’t disappoint either and my son was very excited. The inside of the lunch bag was also easy clean and insulated, with a mesh compartment and a cute label for writing down the owners name and any allergies. There was also a handle, perfect for little hands or clipping onto a pram or backpack, and a zippered pocket on the back which the instructions informed me was where the cooling panel should go. The next day we had planned an outing and it was the perfect excuse to see the lunch bag in action. I removed the now frozen cooling panel from the freezer and placed it in the back zippered compartment. I was happy to see that the cooling panel was kept away from the food which to me meant that things would not go soggy as the ice melted. I packed the bag up with a few of my sons favourite snacks, a sandwich, an apple and a small drink bottle. The bag was quite deceiving as I was quite sure it wouldn’t be deep enough to fit everything but with a bit of a tug on the zipper it all closed up nicely, although a little tight. 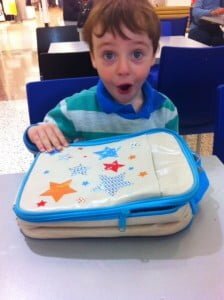 Excitement from Luka at his new lunch bag! When it came time for lunch, my son excitedly zipped opened his bag and I was happy to see that everything has stayed cool and flat, and the fragile snacks had stayed intact and unbroken. Once we were home and unpacked everything, the bag got a quick wipe down with a damp cloth and the cooling panel popped back in the freezer for next time. Here are a few tips if you are considering purchasing this bag for your own little ones. Make sure when you freeze the cooling panel it is done so flat and evenly. The zippered pocket for the panel is quite narrow and if it’s the least bit wonky it will not fit properly, if at all. If you have more than one child who you need to pack a lunch for, you will need to purchase a second bag. Although a good size at 27cm (l) x 21cm (w) x 8cm (d), this bag will not fit a huge amount. If you need to fit a little bit more in I would not include the cooling panel as it will make things very tight and may damage the bag if overfilled. Depending on the size of your drink bottle, you may have to keep it separate. I ended up using a small pop-top bottle of water as my sons larger water bottle was not going to fit. All in all, I really liked this lunch bag and so did my son. It definitely held its own when it came to my rough and messy 3.5 year old, and it will be perfect to take to preschool and school when the time comes. Also, as someone who is conscious of chemicals and nasties, I have peace of mind knowing that it’s PVC/BPA free and non toxic. 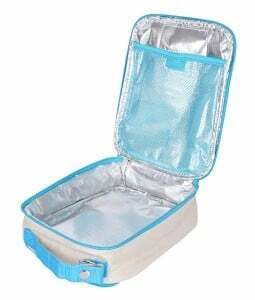 I would highly recommend this bag to anyone looking for a sturdy, easy care lunch bag. At $32.95 it is on the higher scale in terms of price, but given its hard wearing nature, you will not be replacing this product any time soon! The way it arrived beautifully presented means it would also make a perfect and unique gift. Apple & Mint have really nailed it with their unique yet quirky designs and they have a fabulous range of products to choose from. I will definitely be purchasing another bag for my other little tornado! 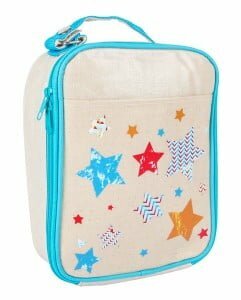 Apple & Mint have a range of lunch bags, back packs and iPad & DVD cases. Click here to go to their website to view the whole range. Laura lives in Asquith with two small boys and one big one. She loves all things creative especially sewing and has just celebrated a year of running a small business making and selling unique baby and toddler products such as Quillows and memory quilts. Laura has also recently started a facebook page called Mums on a Budget. If you're a mum looking for hints and tips from other budgeting mums then it is the page for you! ← Previous Story What would your kids say about you?